This month will be a very heavy month with work for my big my KK Restaurant project. Next week I have my young chefs coming in for training. A Motley Crew of Cooks who I handpicked from many candidates. So this month after nearly 9 years of Christmas classes, I can only hold two or three sessions. The first will be my Fruit Cake Class which I will hold twice and a Roast Turkey Class just a week or so before Christmas. It was a chance whatsapping with Fong Mei Leng about our Jelly Pursuits, and then she suddenly says she’s off to make her Dutch Pancakes. Now I have vaguely heard of this but never ever made it in my life. I don’t think I have eaten it as well. So while whatsapping I googled it and came across a few recipes but the one that fitted my Samsung Screen properly was Martha Stewart’s Dutch Pancake Recipe. 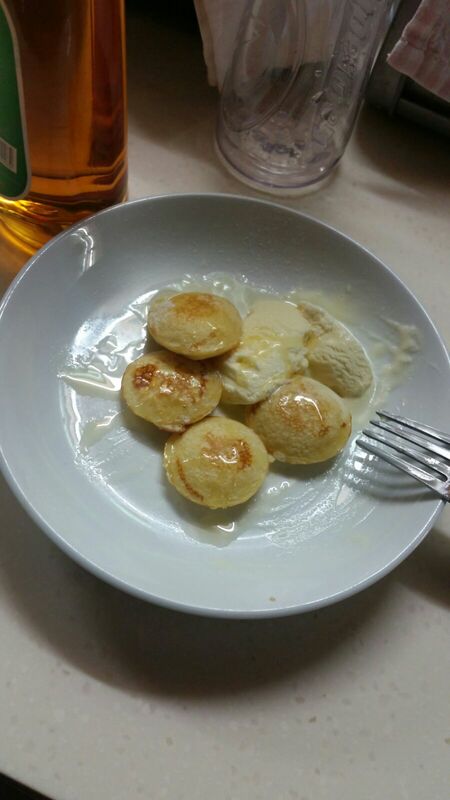 You cannot imagine how quickly you can make this pancake. The longest part of this recipe it preheating the oven. 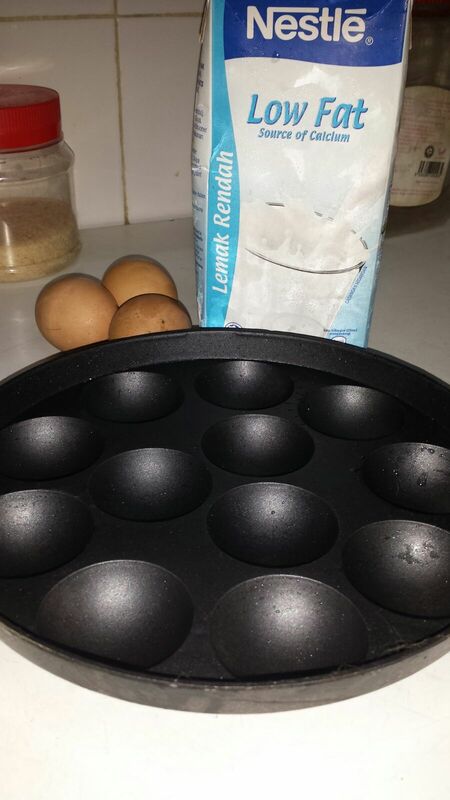 Plain Flour 1/2 cup – loosely the way I do it, unlike Martha’s who said to compact it. Place all the ingredients except the Lemon Slice into the blender and whizz it for about a minute. In the meantime take the tray and skillet out of the oven and brush with butter. Place it back in the oven again. Then in about two minutes, pour the batter into the mould. Just till it slightly to the top. Pour out the rest onto the hot skillet. Bake for about 15 minutes and check. The ones in the mould should be lose enough. one or two might erupt because of the heat and steaming process. Remove from oven. If the skillet is at the bottom shelf, place it on top now. 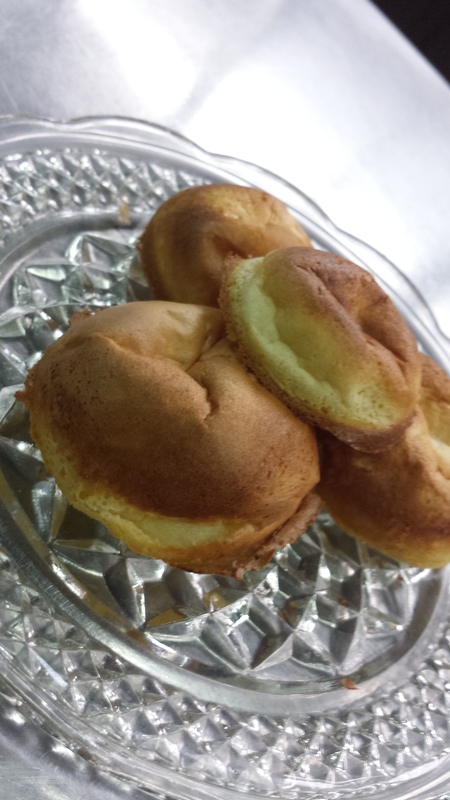 Remove the Dutch Pancake Balls, and eat it like that or dust a little icing sugar on it and squeeze a little lemon juice. 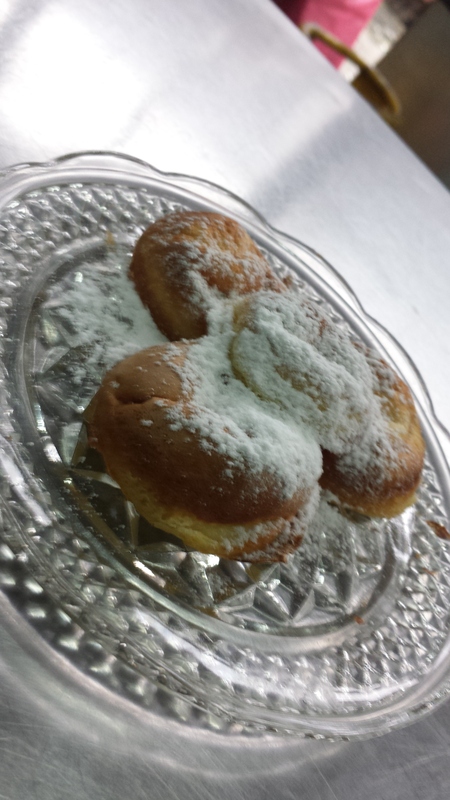 Since I did not use much sugar, I had it with a bit of butter and I dusted some icing sugar so it would look a tad bit more photogenic. The Skillet one, once out of the oven made me realise we can do many things with it to make a complete meal. By adding topping and for me CHEESE… it would be totally different. This can be a wonderful breakfast carb as well. 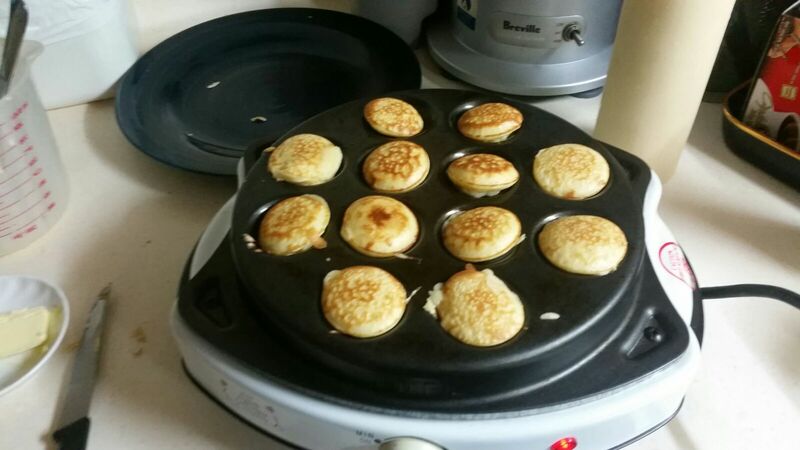 Fong Mei Leng’s Dutch Pancake were much more prettier then mine… Looks more Spunky Dory don’t you think? She used a spunky dory machine as well and hers looked like this. 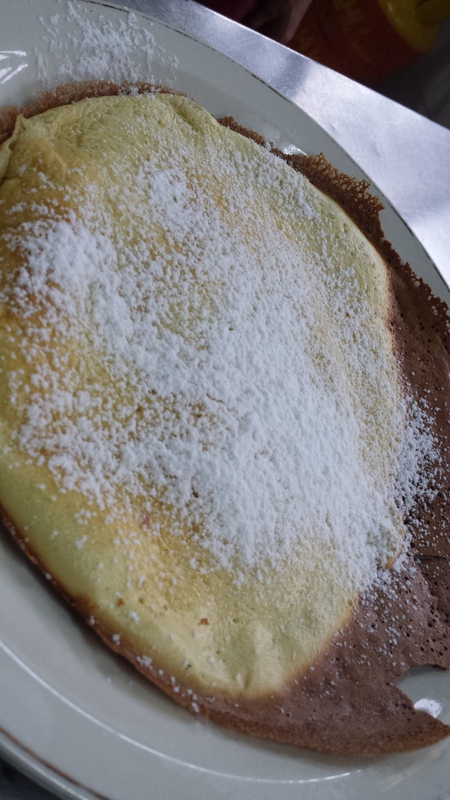 Thank you Fong Mei Leng for mentioning Dutch Pancakes today. I might have it tomorrow as well. 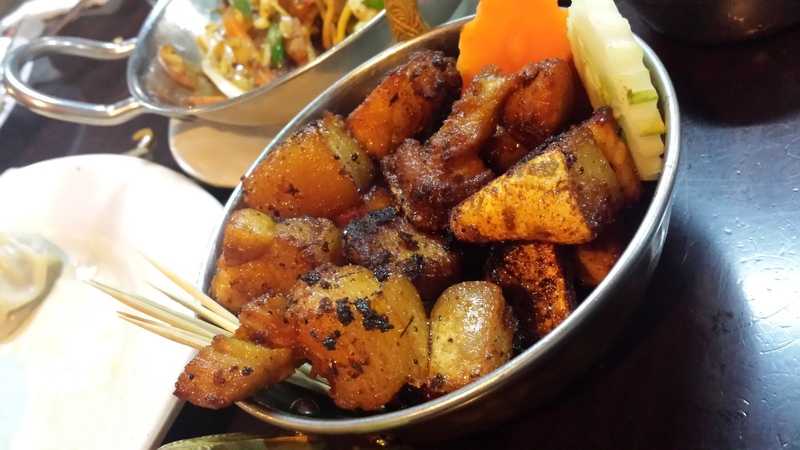 Posted in Cooking Classes in Petaling Jaya, Foodie Escapades, Foodie Friend Fong Mei Leng, Foodie Friends, Foodie Readings, Happy Recipes, Happy Recipes by Nicholas Pillai, Quicky by Nicky! A sudden spontaneous trip to Kuala Lumpur especially to an area I consider rather seedy and I wouldn’t even think of going happened on Sunday. Despite the rain and all the foreigners around I braved it with my Nepalese friend Diwash and walked through the throngs of people that at one split moment I felt I was in Bangalore. So here I was right in front of the restaurant that looked like some 70s flashback and I trodded up the stairs… and behold.. I was in Nepal. The restaurant wall were covered with Nepalese art and photos of Heroes of yesteryear, Kings from a hundred years ago as well as Heroes from History. I was told who was who and what they contributed to the country. It was a nice setting. 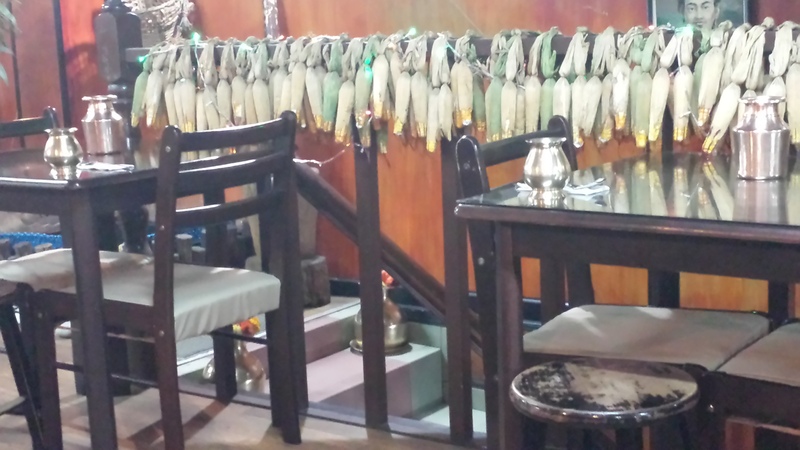 The restaurant is rather well spaced and since it was early by Nepalese eating times, we were the only ones there. So we ordered. The first time I had Nepalese food was in Melbourne about 10 years ago. The second time was early this year when a little shop opened near my house and I excitedly went quite often and then the CLOSED! Just like that. So I was quite excited because this restaurant had a bigger variety then the one that was near my house. So of course we ordered Momos. Now Momos are like little Xiu Long Baos minus the finer skin and of course this has a slight spicy flavor. It is pure meat and is always eaten in tens. That is ten pieces per person. This I learnt from Santosh Ghimire my neighbor. 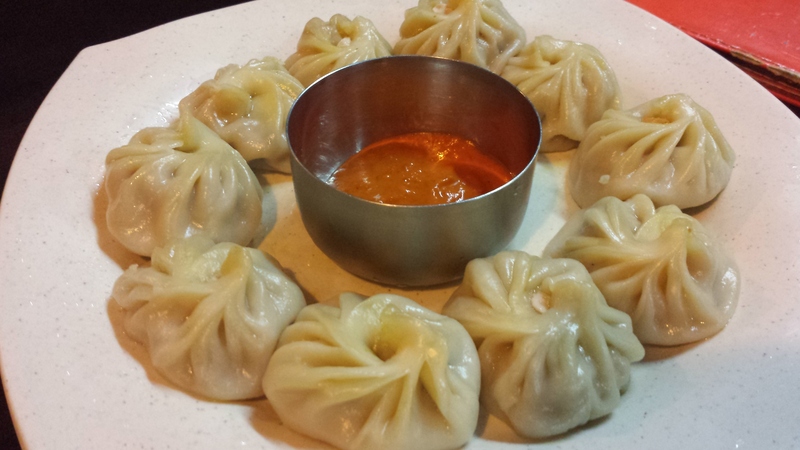 Momos are usually made with Pork, Chicken or Vegetables. I have so far only eaten Chicken Momos. Now the difference between a Momo and a Xiu Long Bao is there is practically no soup within the dumpling. The meat is heavier because there is nothing added to it except pure meat. 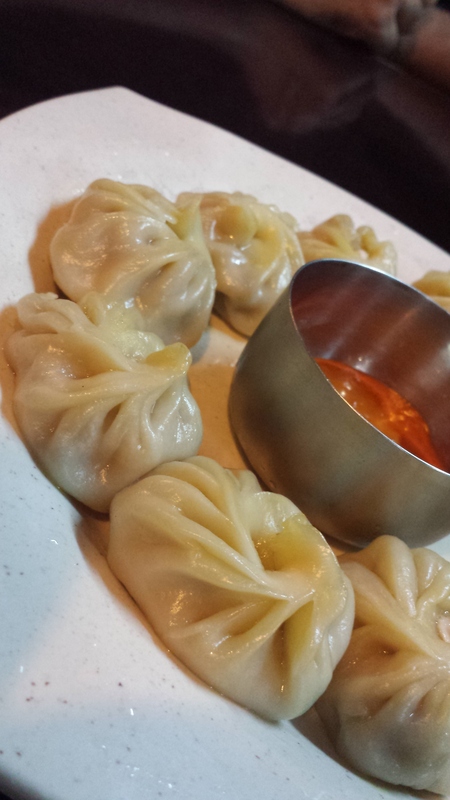 I could never eat ten momos at one seating, but I could manage five if I had nothing else to go with it. I think they look so luscious in the photo above. The next was Chicken Chaumin. 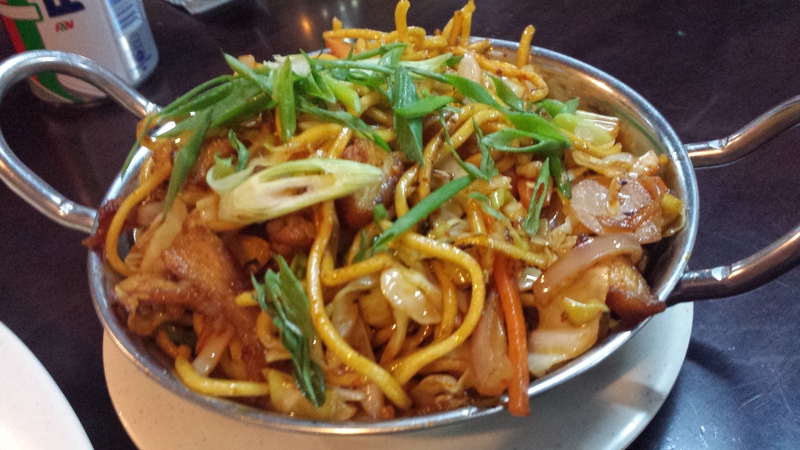 This is a Nepalese version of fried noodles. So far I have had three different versions and they all tasted equally nice. There is that slight spiciness from the chillies as well as a bit of sourness and the slightly charred taste (Wok Hei) gives it that last bit of kick and flavor. I wish they would add a bit more vegetables because mine just had too much chicken I feel. But then that’s just me. I am keen to know what noodles they use in Nepal because they use the normal noodles we have available in the markets. I am sure it is different. I once had Buffalo Chaumin but it was like eating chewy rocks! I did think the chicken was a tad bit too fried that it became a trite dry. But if complemented everything. Chicken Choyla was the next dish. Bloody spicy is the first word that comes to mind. I like picking and since it came with toothpicks on the side, I was quite excited. I had a pair of chopsticks though. It needed to go with rice that’s for sure. It was salty as well because it was meant to go with liquor on a cold night. Nepalese food tends to be a bit salty. 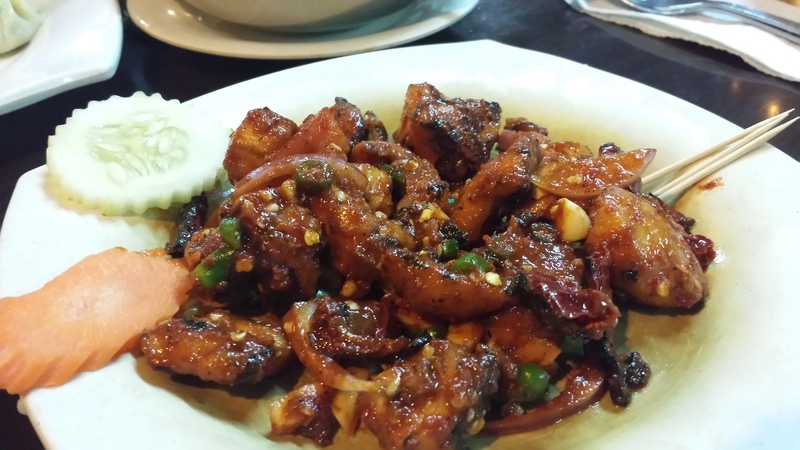 Chicken Choyla had onions and chilies and had a nice refreshing tang to it. Actually while I grumble that it was spicy, as I am describing this, my mouth is actually salivating. I did find the meat a little over fried. I wonder if it is necessary to do that. But it was something different. Pork Sekuwa was next. At first sight… PUT OFF! The sight of fried pork pieces with fat and skin didn’t do anything for me. First mouthful, well it was piping hot.. so we didn’t get much flavor. Second mouthful, simple ingredients, but everything blended well. Again this dish would go well if one was drinking that night. I say simple ingredients because there was not a trace of spice or anything foreign, just salt and pepper and fried on a high flame. Mind you portions might be smaller then we are usually used to. So order a few things. Enter the place with an open mind. A lot of us tend to look down on the foreigners foods, but trust me, I have been surprised and today I was surprised. Braving the honking taxis and buses to get there and walking through the rain (because I never run in the rain for fear of falling and looking like a big heap) was worth it. Simplicity is of the essence here, but the food was really good. I hope to go again this Thursday! If I do, I will add the photos and explanations to this story.